My neighborhood has an annual Labor Day cooking contest. The hostess decides on the type of food, the neighbors cook up their best dishes, and everyone at the party votes for their favorite. The year we moved in, the competition was for the best homemade salsa. I’m competitive as hell, but I’m not a good cook. Luckily, my husband is an excellent cook, and he makes an amazing homemade salsa. “The rules say you get judged on taste AND appearance,” I reminded him. Andy capitulated, letting me arrange the salsa and chips on elegant crystal. He won, of course. He says it was the green onions, but I knew it was the crystal. The next year’s competition was for best appetizer. I arranged Andy’s potstickers on a ceramic tray, which he approved, but the man rolled his eyes when I brought out crystal for the dipping sauce. The year after that Andy won with his caprese salads, artfully arranged on a silver platter. “But I’m not a good cook,” I whined. I checked. And there was actually a chocolate cake recipe with instant mashed potato flakes. I made it, added some killer icing, dipped some Pringles in ganache for garnish, and arranged it on crystal, of course. Andy stuck his poutine in a pie pan. Our entries. Whose is the prettiest? There may have been a few muttered grumbles about how potato flakes shouldn’t count, but I didn’t care. Beating thirty other dishes, especially Andy’s poutine with homemade French fries and gravy, felt like a real accomplishment. Pain du Mom from this amazing cookbook. The following year, the theme was brunch. 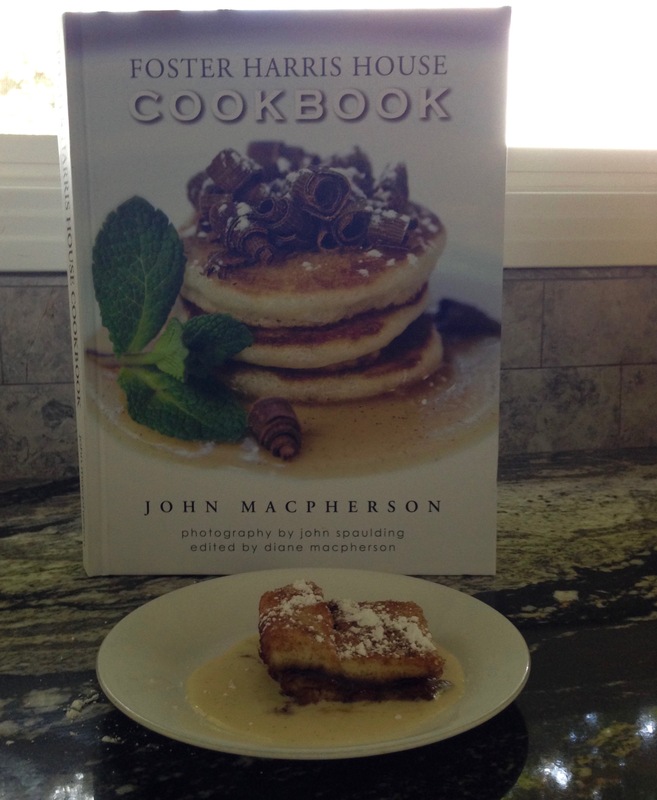 Andy arrived with a timballo, while I made pain du Mom, a baked French toast in a custard sauce. Last year, contestants had to bring a “family dish,” a type of food they cooked on a regular basis, possibly cultural. I made “Six-hour Cake,” a triple layer Devil’s food cake with poured ganache frosting, because I make that for Andy’s birthday every year (my family had no culinary tradition beyond Hamburger Helper). Andy, perhaps still smarting from his defeat two years in a row, refused to participate. Before voting started, however, our hostess made a surprise announcement. “This year,” she said, we will have winners in two categories: savory and sweet! And there will be one prize for appearance and another prize for taste!” There was a notable amount of cheering, especially as the other contestants realized that Andy hadn’t brought his potstickers or hot and sour soup (because he is foolish and didn’t listen to me we could have won EVERYTHING). My cake at home and up against the competition. I wanted to yell, “Hell, no, it’s not, that cake really does take six hours to make and piping the trim isn’t easy! Hand over the booty, woman!” but of course I smiled politely and nodded as some uninspired drop-cookie maker sailed off with the autumn-themed cheese knives that should have been mine. 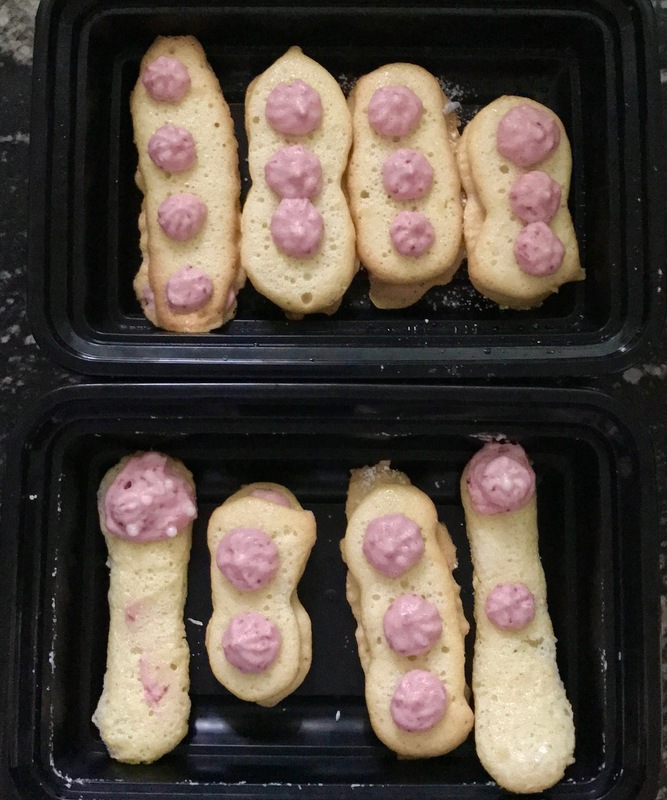 Last weekend, the contest theme was “finger food.” I had my dish all planned – ladyfingers, made from European sponge cake batter, complete with pink strawberry fruit cloud cream manicures. What could be more perfect than a finger pun, right? Except that it was 100 degrees with 99% humidity (unheard of in Los Angeles). So my nicely rounded fingers melted down, losing their shape before they even got in the oven. After one smallish temper tantrum, I hit upon a solution: I turned the flattened fingers into sandwiches filled with strawberry fruit cloud cream. They were now Vienna Fingers. But I was nervous as I placed my crystal cake plates on the judging table for desserts. My European sponge cakes were soaking up the humidity like, well, sponges, getting stickier by the second. A well-created chocolate chip cookie might trounce my ladyfingers. I retreated to the patio to brood and sweat with the other guests. A parade of paper plates passed by over the next hour, but I didn’t see a single ladyfinger. Eventually, I went to the table, ready to pass the trays of ladyfingers around the party myself. My empty crystal plates sat on an empty table. She was right. I did win. Winning unopposed wasn’t satisfying at all. Maybe it’s time to retire. Or maybe…maybe next year I can convince Andy to try a dessert. This one brings me fond memories of my competitiveness. We had contests at work. It started as a chili contest and then was broadened to anything that worked in a slow cooker. I won the chili contest. However, my HR department was overseeing it so that automatically disqualified me from getting public adoration. The guy who won had a good chili but not as good as mine which did not use hamburger but a barbequed roast. It was very hard to contain myself. After that I decided not to enter (as I’m not a good loser especially when I won). Fast forward several years and we had a dessert contest at the company picnic (also overseen by my department). We weren’t getting enough contestants and I feared we wouldn’t have enough desserts for everyone so I bought two boxes of brownie mix and a can of frosting. Yes, my dessert was the most popular but of course unannounced. People kept asking me for my recipe. So embarrassing because I have a really good brownie recipe with REAL butter. That told me that the folks I worked with did not value homemade and were just as happy with a box dessert. I always said if you brought in breaded cat turds, they would eat it, compliment you and ask for the recipe. I love your neighborhood! LOL, I think some of my neighbors would be okay with cat turds, too. But we had one woman this year who made homemade miso. She spent a year fermenting the soybeans, and it was incredible — so much better than any I’ve ever had. But she didn’t win! I think a bacon wrapped something or another won. Chocolate and bacon tend to be the be vote-getters. I would’ve been miffed if I were you, especially because I loathe hamburger. You totally should have won. Was the prize cash? The cash was minimal, like $25 gif card. It was walking around with a puffed up chest that I missed. Ooh, that would be exciting. This is an interesting phenomenon that I never really pondered before, I guess because my blog is mostly real-time. LOL, there are no grandchildren, I promise. But now I feel I’ve let you down. Are you and Andy really that good? Damn! I got to try some of your and Andy’s cooking 🙂 They sound good! Not as good as hot chocolate in the Netherlands! Autumn, I have to confess something. If I met you without knowing you through the blog before, I think I would hate you hahaha. I’m the least competitive person ever. I hate competing in anything (so I mostly don’t even try hahaha). Your life sounds very restful. I think Andy would prefer to not compete and merely drink beer and judge. 🙂 I’m more like a bull — wave a competition at me like a red flag and in I go. I’ve enjoyed watching the Great British Bake Off, but I don’t bake anymore. I try not to eat too many sweets, but of course, temptation always gets the better of me. To keep it to a minimum, I go out and buy a pastry or a single piece of cake–the expensive way to buy sweets. Wow! You really are competitive. I’m with Marta, I’m not very competitive. I like to do well, but I don’t care much about winning. I want to be the best and be recognized! Yes, buying single pastry items is expensive, but much healthier than buying or making an entire cake. Good for you. Sounds like you and Andy are just too good… were there any RIVALS that gave you a run for your money!?! 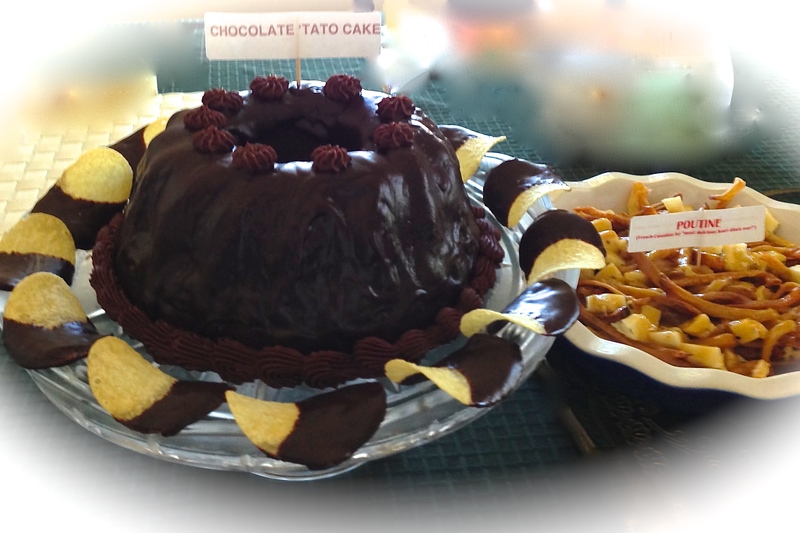 Aha, I recognize that chocolate ganache cake 😉 The potato flake cake is genius… I loved the chips surrounding the cake, brilliant! Will you venture out of comfort zone to try savory next year? And nobody is asking for a recipe? May I? I’m intrigued by the six-hour cake. Especially since you have chosen it to celebrate Andy’s birthday. It would be a five hour cake if I had a bigger oven, I think. I can’t fit all three layers in mine at the same time! 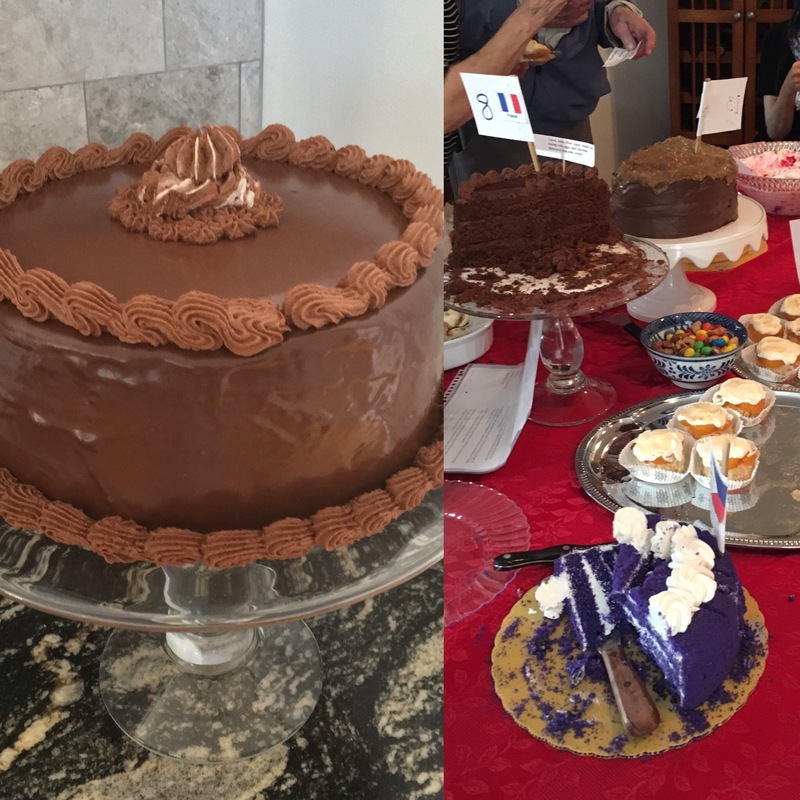 I’ve made multiple kinds of cakes — everything from cinnamon sugar coffee cake to a flourless chocolate torte to cheesecakes, to genoise, to haupia cakes, but Rose Levy Bernabaum’s Devil’s food cake with chocolate ganache filling and frosting is his absolute favorite. I’ll get to a post about the story of how it became special someday. Thanks, although it feels quite hollow this year! 😉 I guess we are extra competitive — we did meet in the world of competitive dancing. But now we’re wiser and only competitive when we’re actual contenders.